The remote server queries its DNS server for the MX (Mail eXchanger) record of the “example.org” domain. (If no MX record was found it tries again and asks for A (address) records. That’s a fallback solution.) Let’s run a query for a real domain to get an idea. Let’s ask which servers receive email for …@gmail.com. So as a result we get 5 different MX records. Each of them consists of a priority and the host name of the mail server. 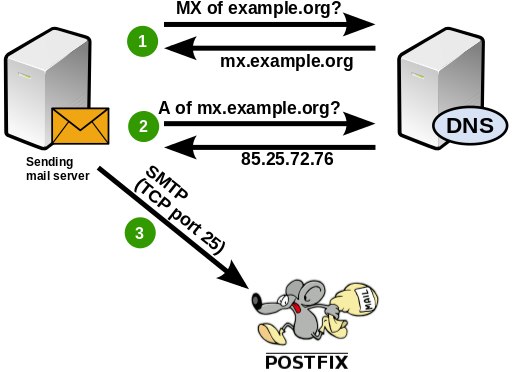 A mail server would pick the entry with the highest priority (=the lowest number) and establish an SMTP connection to that host. In this example that would be the priority 5 server gmail-smtp-in.l.google.com. If that server could not be reached then the next best server with priority 10 would be used and so on. So all you have to do in your own DNS zone is add an MX entry pointing to your mail server. If you want to run a backup mail server (which is outside of the scope of this tutorial) then you can add a second entry with a an equal or lower priority. A mistake some people make is using an IP address in MX records. That is not allowed. An MX record always points to a host name. You will have to add an A record for your MX record to point to the actual IP address of your mail server. It’s best to explicitly name mail servers explicitly for your domain in the MX records. If you can’t do that for whatever reason then the remote mail server will just do an A record lookup for the IP address and then send email there. If you just run one server for both the web service and the email service then you can do that. But if the web server for your domain is located at another IP address than your mail server then this won’t work.